Tonight’s open house meeting at SF General Hospital is your chance to show support for wider sidewalks and safer walking on Potrero Avenue. City planners, swayed by parking-obsessed extremists who are fighting wider sidewalks and disseminating misinformation about the project, will present new, heavily-watered down options that cut out sidewalk expansions to preserve car storage. 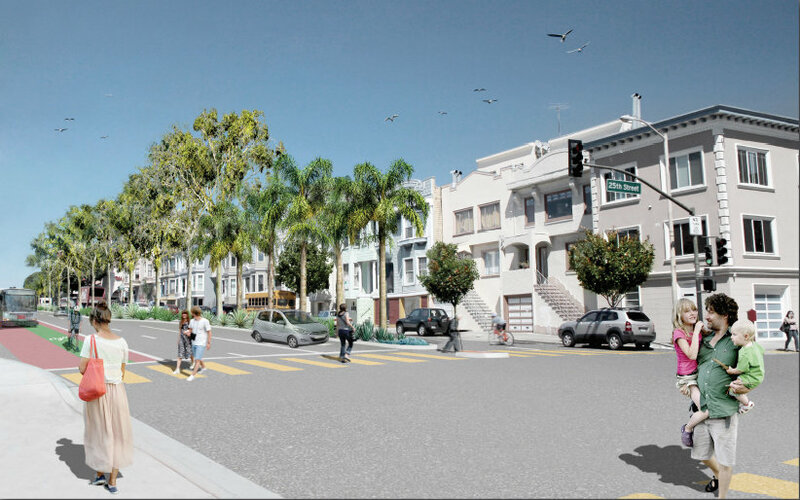 DPW's rendering of one design option for Potrero Avenue. Whereas the original proposals for Potrero would have removed 100 parking spaces for safety upgrades, the Department of Public Works will only present two options tonight: Option A and Option C, which would remove 58 and 28 spaces, respectively. Option A would only widen the eastern sidewalk to 14 feet between 22nd and 24th Streets (downsized from the originally proposed four-block expansion). Option C would widen no sidewalks at all, but include some corner bulb-outs. The proposals also fail to include protected bike lanes or add a transit-only lane. The open house will be held from 6 to 8 p.m. in the SF General Hospital cafeteria, located on the second floor, at 1001 Potrero. You can also sign an online petition in support of wider sidewalks on Potrero. I’m confused. I can (sorta) see why people object to loss of parking spaces, but there are actually those who object to better transit? That link doesn’t lead to a petition.